Ah, rugby league. All grown up. 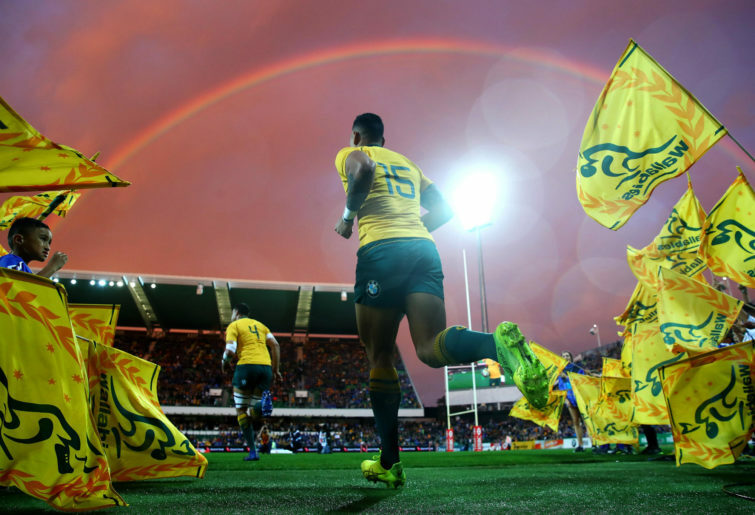 For now that Rugby Australia’s taken a moral stand and seems certain to punt the demonstrably homophobic Israel Folau, there were musings that rugby league could welcome the prodigal son back into its bosom (as happened, ironically, in the same Bible Israel’s been using to spout anti-gay dogma). Might the Return of Israel be spun into one of those redemption stories rugby league so loves? Gadzooks! Could Israel fill the hole left by Valentine Holmes and slot straight back onto the wing for Queensland? Will rugby league welcome Israel ‘home’? It will not. Rugby league’s commission has kyboshed it as the madness it would be. Just as it would be madness for rugby union, even in a World Cup year, to have a bigot representing Australia. Because rugby league, along with the greater community, has moved on, has progressed. Rugby league grown up. Rugby league has gay mates. Rugby league had a gay anthem in the grand final. Rugby league has a float that parties up Oxford Street each year. Rugby league is cool with the gays. Thus it would be a bit hard to link the NRL’s brand to the greater goodwill of Mardi Gras if the game’s star signing is a high-profile homophobe who thinks gay people are lesser human beings whose consciousness is condemned to eternal torture in make-believe dungeons. It would be hard to sell the game as inclusive of people of all faiths, sexes and sexualities if there’s a homophobe on $1 million a year bopping about on the wing for the Bulldogs. It would actually be impossible. And rugby league knows it. For if there’s a game that knows the power of negative publicity upon a brand, it is greatest game of all rugby league, dear sweet Schlossy’s shoe, yes. And after all that malarkey over summer, you think rugby league would actively invite bad press? It finds the game easily enough without Israel’s dangerous hate-gibber. For rugby league’s money types and marketeers know that the ‘brand’ of Israel Folau is untenable. The brand of Israel is now of kook, homophobe, religious weirdo. And ain’t nobody got time for a religious weirdo. Because while the vast majority of Australians are cool and tolerant with religious people, believe whatever you like, go for you life, just don’t try to sell it to us. It’s your democratic right as an Aussie to believe whatever you like. Religious freedom is go. Good luck to you. Just don’t preach it because you can tell your story walkin’, as the Jehovah’s Witnesses my grandad put the hose on would attest. And that’s what rugby said to Israel a year ago – believe it, Izzy, all good. But mention it again in public and you will no longer be our employee. Rugby league’s quick response to Folau’s axing smacks of a stance by dear old cousin Rah-Rah after Ben Barba was frog-marched out for the 19th and final time. Rugby union made it very clear very quickly that Barba wasn’t welcome in that code, despite all his turnstile-spinning gifts. 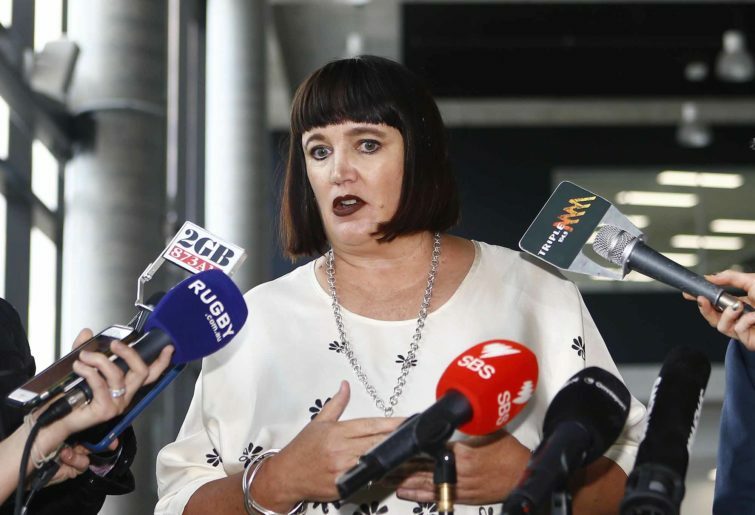 Granted, it was an ultimately pragmatic move by Rugby Australia as well as a collegial one, for theirs is a policy of No Dickheads much less types tainted by violence against women. But it also felt like rugby took a position above picking the eyes out of their competitive rival. Feels a bit like league’s doing same. Now – if you’re of the opinion that she’ll be right, mate, Israel’s just a drongo, who cares about his dopey views, he’s entitled to freedom of religion and also expression, and let him play, and all that, then, friend, I submit that you are missing the point on a number of levels. Ask a gay mate, there’s not space here to explain why a high-profile community thought-leader like Israel shouldn’t tell people born how they are that they’re lesser human beings who need to change or else. 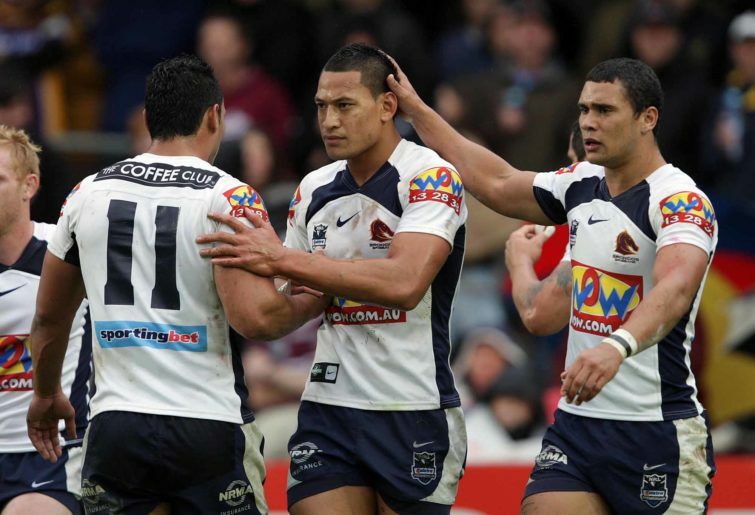 Consider rugby league’s large contingent of Polynesian players, all of whom would admire – as we all do – the athleticism and skill of the global superstar Israel Folau. Kids look up to Israel like he’s Super Uncle Number One. And a lot of Polynesian folks are religious like Israel. And if some of these young ones are gay or wondering if they might be, and they’re being told by Israel they’re a lesser dude off to a Hell that they believe in, well, it’d be worse than Dennis Lillee saying you’re a wanker and a softcock. It would be dangerous. Life and death stuff. Suicide is the leading cause of death for people aged 15-44. Young men are susceptible to the messages of their senior peers. Young dudes see themselves in older dudes, as the dudes they’d like to be. And when said older dude is getting all fire and brimstone, and spreading the word of … I dunno, whoever it is, Galathumpians 22:3 – “Thou shalt do as we say or thou shalt be royally rooted forever”, well, it would weigh heavily upon a young dude whose body is saying one thing, his religious community – hero Israel foremost among them – another. And there’d be thousands of kids like that. And it’s dangerous and wrong to tell them they need to “repent” because Israel’s interpretation of an old book says so. And there’s another thing, rugby league, as you know: you want to be inclusive of as many people as possible. You don’t want to turn people away. So how could you have a big star of the show telling drunks, fornicators, idolators, homosexuals and a few others (and I bet you, like, me, ticked a few boxes) that they’re lesser people? You could not. It’s not a message rugby league wants to tell. Rugby league wants to include all people, not cast them into a pit of flames if they don’t conform to a passage in an old book. Doesn’t sound like something nice Jesus would do. Now, if you’re a believer in the great man (Jesus, not Israel), respect, and go well. He sounds like nice man, and many of the tales in the Bible are about doing the right thing by one’s fellow man, and let’s hope the meek do one day inherit the earth. It’s not the worst book of rules, mores and lifestyle tips. But, y’know, you’d have to admit there’s a few passages in it that aren’t, well, very PC. Tell that story walkin’, Izzy. Matt Cleary is a sports writer from Sydney. He enjoys golf, footy and Four Pines Pale Ale, and spends as much time as conscience allows at Long Reef GC. You can read him at his website and find more of his golf columns over at Patreon.